How to Install a package AC units? Purpose :- Now a days every Telephone Exchange requires Air Conditioning. The modern Telephone Exchanges install the Electronics Equipments. 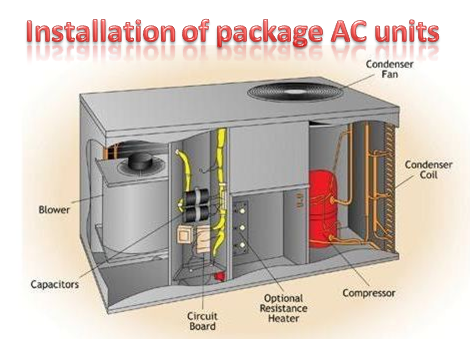 So, the installation of package A.C. units is one of the most important activities pertaining to the electrical wing. Objective :- After discussion of this the trainees will be able to install the package A.C units in a proper &correct method, so that during their use there will be minimum complaints. The installation of package A.C. system in any building required utmost caution and coordination from the very beginning of the construction of the building/Exchange. After obtaining the working drawing the JTO(E)has to study the schedule of Accommodation thoroughly, specially the package room and the rooms which are to be air conditioned. During construction of the building following openings are to be made either in the walls or in the floors. a) Opening for the delivery duct. b) Opening for the return air duct/boxing. c) Opening for fresh air fan in the package room wall. d) Opening for refrigerant pipes and condenser cables. e) Opening for main cable entry. f) Opening for supply water pipe for humidification package unit and drainage pipe for condensed water. If the duct drawing is available with the junior engineer, the opening is to be made as per that duct drawing. The openings are required in the package room, switch room or in any other room where A.C. ducts are to be provided. If approved duct drawing is not available with the JTO(E), the size of the opening is to be decided on the basis of permissible air to be delivered by the duct is to be known, and the number of package A.C. units i.e. their capacities are to be calculated. As for example if two number of 7 TR capacity of package are kept as main and one number package A.C. is kept as standby, the approximate quantity of air to be handled by the main duct will be = 2 x 7 x 500 (500 CFM has been considered per TR) = 7000 cm. Now velocity of air to be delivered through the main duct is to be decided as per the recommended chart for duct design. As per this chart the maximum permissible velocity of air through main delivery duct is 500 meters per minute. Let us take 400 mtrs (1312 feet) per minute for this job. Now the cross section of the main duct will be 7000/1312 = 5.34 Sq.feet. the opening of the wall should be slightly more than the cross section of the duct, the opening may be 6 sq. feet (2 feet x 3 feet). In the same manner the opening for other branch duct etc. can be calculated. In the same method as specified above the opening for return air duct or boxing can be calculated. Opening for the fresh air fan is kept in the package room. Generally the size of the fresh air fan ducting is 600mmx600mm. So the opening can be made as 610mmx610mm allowing the frame work for fixing the duct. The location of the fresh air fan should be such that the fresh air should not directly hit the delivery duct. This opening is also to be kept in the package room and the rooms through which the pipes are to be laid. This opening varies on the basis of number of package A.C. units. More the number, the opening should be more. For each package A.C. two pipes and one cable for condenser are to be laid. However for 4 Nos. package A.C. units the opening of 150 mm x 600 mm will be enough to accommodate 8 Nos. refrigerant pipes and 4 Nos. cables. The more the number of package unit more will be size of the opening. Generally 3 Nos. cables are drawn from the sub station to the package room. The opening of size 150 mm x 300 mm will be sufficient. However, in place of that 3 Nos. holes of size 500 mm dia can be made in the floor or in the wall as per site requirement. It should be near to the main control panel. The opening for supply water pipe can be decided after consultation with the civil engineering staff. The water supply can be taken from the nearest bath room or from the overhead tank. However, an opening of size 25 mm will be sufficient to provide 19 mm dia G.I. pipe for supplying of water for the humidification package. This opening is required to provide G.I. pipe to drain out the sweating water of the evaporator and over flow water from the humidification package unit. Generally 40mm dia. G.I pipe is provided for this purpose a hole of size 50 mm will be sufficient. The location should be to such a place so that water can be discharged either to the nearest bath room or the outside drain. After award of work, the materials and equipments will be received by the Department specially, the package A.C. Units and condensers and the agency will ask for payments. As soon as the equipment reaches at site these are to be checked as per the technical specification mentioned in the agreement. Specially the motors, compressors etc. & their make, model No. etc. If any deviation in specification and the material/ equipments supplied is found, the matter is to be reported to the senior authority. The equipment are also to be checked physically for the damages if any damage caused during the transportation, loading and unloading. If any damages are there, the details of the damages are to be intimated to the agency and to the senior authority for further necessary action at their end. Damages of the condenser and evaporator fins reduce the efficiency of the unit. So the agency is to be asked to make the same good. If the damages are found to be heavy, the agency should be asked to replace the item i.e. condenser or evaporator.